Mpatso has been coughing for two months. Coughing consumes his energy and his appetite. When his skin begins to sag, he takes the advice of his relatives and makes the two-hour journey to a health center. Mpatso has AIDS and tuberculosis. In his village in rural Malawi-an agrarian, landlocked nation in Southern Africa, hard hit by AIDS and resurgent tuberculosis-Mpatso's diagnosis carries a very poor prognosis. Malawi, like most of the countries in sub-Saharan Africa, faces the combined challenges of poverty, high burden of disease, and limited health services in the public sector. But Mpatso's case is an exception: shortly after he arrives at the Neno District Hospital-a public hospital in the rural reaches of southern Malawi-he is seen by a team of clinicians. That same afternoon, he is diagnosed and begins treatment for both diseases. The treatment involves a dizzying number of pills, but his are delivered daily by a community health worker who also helps him follow his therapeutic regimen. Mpatso's life will likely be prolonged by a decade or more. Down the hall from Mpatso's exam room, a neighbor gives birth with the support of a nurse-midwife. In an adjacent room, six women are in labor under the watchful eye of the clinical staff and within feet of a clean, modern operating room. In this and in many other respects, Neno District Hospital differs from most health facilities nearby (and throughout rural sub-Saharan Africa). The hospital is a comprehensive primary care facility, providing ambulatory care for more than one hundred patients each day. It has about fifty beds, a tuberculosis ward, a well-stocked pharmacy, and an electronic medical records system. The facility is staffed by doctors and nurses from the Ministry of Health. In the midst of one of the poorest and most isolated areas in Malawi, a robust local health system is delivering high-quality care, free of charge to the patients, as a public service. How was this system put in place in a country where effective health services are typically unavailable, and how can comprehensive health systems be built across the developing world? How is the double burden of poverty and disease experienced by individuals like Mpatso or his neighbors across the border in Mozambique? How can history and political economy help us understand the skewed distributions of wealth and illness around the globe? These are a few of the questions that motivate our investigation of global health. As the preface notes, global health is not yet a discipline but rather a collection of problems. The authors of this volume believe that the process of rigorously analyzing these problems, working to solve them, and building the field of global health into a coherent discipline demands an interdisciplinary approach. Describing the forces that led Mpatso to fall gravely ill with tuberculosis-a treatable infectious disease that has been banished to history books in most of the rich world yet continues to claim some 1.4 million lives per year worldwide-requires both biologic and sociological inquiry, an intrinsically biosocial analytic endeavor. The roots of the limited health care infrastructure in rural Neno District, a former British colony long on the periphery of the global economy, are historically deep and geographically broad. Most textbooks of public health have been written by epidemiologists, and we of course draw heavily from this field, relying as well on insights from clinical medicine and public health disciplines such as health economics. But the course we teach at Harvard College (like the courses we have long taught at Harvard Medical School and the hospitals with which we're affiliated) is not the same as those taught by public health specialists. Those who have developed this course and this book are all jointly trained in clinical medicine and in anthropology or political economy. Thus we also seek to critique prevailing global health discourse with what are called the resocializing disciplines-anthropology, sociology, history, political economy. Our approach hinges on social theory, which we explore in the second chapter, and aims to interrogate concepts and claims of causality widely used in the literature on global health. Our experience as medical practitioners has also shaped our approach to this volume. As we demonstrate in chapter 6, adapting a fully interdisciplinary investigation to basic questions-how did Mpatso become ill, and why?-has directly informed our practice. We see this close coupling of inquiry and implementation-the vitality of praxis-as central to our work: traversing the space between reflection and pragmatic engagement is necessary in any attempt to distill a core body of information about global health. Limitations exist in any team's knowledge of a particular field, and this book is of course based on material with which we are especially familiar, including the work of the nongovernmental organization (NGO) Partners In Health, the focus of chapter 6. We begin by taking a look at the global distribution of poor health and the factors that structure this distribution. Globally, heart disease was the leading killer worldwide in 2004 (see table 1.1); cerebrovascular disease and chronic obstructive pulmonary disease ranked in the top five. This picture looks different, however, when we compare high- and low-income countries. Five of the leading causes of death in low-income countries-diarrheal diseases, HIV/AIDS, tuberculosis, neonatal infections, and malaria-are treatable infectious illnesses that are not found on the leading list of killers in high-income countries. Nineteenth-century diseases like tuberculosis, malaria, and cholera continue to claim millions of lives each year because effective therapeutics and preventatives remain unavailable in most of the developing world. Although effective therapy for HIV has existed since 1996, and medicines now cost less than $100 per year in the developing world, AIDS is still the leading killer of young adults in most low-income countries. In fact, 72 percent of AIDS-related deaths occur in a single region, sub-Saharan Africa, which is also the world's poorest. Diarrheal diseases are often treatable by simple rehydration interventions that cost pennies, yet these diseases rank third among killers in low-income countries. Table 1.2 presents similar data, this time using a measure that takes into account both disability and death. This measure, the disability-adjusted life year (DALY), which is a way of quantifying years lost to poor health, disability, and early death, is not without its flaws; we will examine it in chapter 8. This tool, reflecting morbidity, shows a similar picture of health disparities between high- and low-income countries. It is also apparent that noninfectious conditions-such as birth asphyxia and birth trauma, together ranked number seven in DALYs lost for low-income countries-are disproportionately distributed in low-income countries. Like the treatable infectious diseases just described, these forms of morbidity and mortality are often preventable with modern medical interventions and are thus much rarer in the wealthier parts of industrialized countries. Another stark picture of this disparity can be seen in map 1.1: despite some improvements over the last two decades, average life expectancy in low- and middle-income countries in sub-Saharan Africa stands at 49.2 years-fully 20.2 years less than life expectancy in high-income countries. The relationship between gross domestic product (GDP) and health is one starting point for an examination of global health inequities. But national measures of wealth such as GDP and GNP (gross national product) are well worth pulling apart. "Domestic" and "national" data often (perhaps always) obscure local inequities, such as those seen within a nation, state, district, city, or other local polity. We will grapple with the many layers of these inequities throughout the text, beginning with a theory of structural violence in chapter 2. Figure 1.1, compiled by the World Health Organization's Commission on the Social Determinants of Health, illustrates one example of the substantial differences in health outcomes between rich and poor households within single countries. Figure 1.2, from the same report, highlights another measure of social status across countries-in this case, mother's education level-that correlates with health outcomes such as infant mortality. The impact of social class, among other social, political, and economic factors, on health is taken as a given in this book, as it is in others. But we will also delve into the complexities of causation and the structures that pattern both the risk of ill health and access to modern health services, even as we explore effective and ineffective interventions in global health. Why is Mpatso able to attain good health care despite living in poor, rural Malawi, while so many others in similar circumstances cannot? One question quickly arises in any study of this field: what do we mean when we use key terms such as "public health," "international health," and "global health"? More fundamentally, how should we define "health" itself? The World Health Organization (WHO) defines health as a state of physical, mental, and social well-being. But is this how Mpatso understands health? Can any definition of health capture the subjective illness experiences of individuals in different settings around the globe? Beyond the direct experiences of individuals are social, political, and economic forces that drive up the risk of ill health for some while sparing others. Some have called this structural violence. Such social forces become embodied as health and disease among individuals. Though they share the goal of improving human health, "public health" and "medicine" are in many ways distinct. Public health focuses on the health of populations, while medicine focuses on the health of individuals. But in reifying the distinctions between them, we risk perpetuating unhelpful visual field defects in both professions. Clinical insights inform public health practice, and public health analysis guides the distribution of medical resources. But we believe both fields must also utilize the resocializing disciplines to address the fundamentally biosocial nature of global health problems. Microbes such as HIV and Mycobacterium tuberculosis cannot be understood properly at the molecular, clinical, experiential, or population level without analysis spanning the molecular to the social. Jonathan Mann, physician and public health expert, put it this way: "lacking a coherent conceptual framework, a consistent vocabulary, and consensus about societal change, public health assembles and then tries valiantly to assimilate a wide variety of disciplinary perspectives, from economists, political scientists, social and behavioral scientists, health systems analysts, and a range of medical practitioners." All fields have myopias. The restricted gaze of each discipline can illuminate certain global health problems; but only when they are taken together with a fully biosocial approach can we build, properly, the field of global health. A word on the term "global health." An antecedent term, "international health," emphasized the nation-state as the base unit of comparison and implied a focus on relationships among states. Global health should more accurately encapsulate the role of nonstate institutions, including international NGOs, private philanthropists, and community-based organizations. Pathogens do not recognize international borders. But much churn-social and microbial-is introduced at borders. Further, we seek to examine health disparities not only among countries but also within them-including our own. Boston (like Cape Town and São Paolo and Bangkok) has some of the world's finest hospitals but also great disparities in burden of disease and access to care; it is on the globe, too. A final note on definitions: "global health delivery" refers to the provision of health interventions, a process distinct from discovering or developing such interventions through laboratory research or clinical trials. Global health delivery begins with the question, "how can a health system efficiently provide health services to all who need them?" More efficient and equitable delivery of existing health interventions could save tens of millions of lives each year. But even the best models of global health delivery cannot alone raise the standard of health care available to people worldwide. The health of individuals and populations is influenced by complex social and structural forces; addressing the roots of ill health-including poverty, inequality, environmental degradation-requires a broad-based agenda of social change. The chapters in this volume have been drafted by course faculty, guest lecturers, teaching fellows, and-in a few instances-outstanding former students from our Harvard undergraduate course Case Studies in Global Health: Biosocial Perspectives. In developing the syllabus and course content, we observed that despite the wealth of scholarship in this area, the number of introductory texts approaching global health from a biosocial perspective was limited. In positive reviews during the first year of the course, students encouraged us to find ways to make the course material accessible beyond our classroom. We decided that this project could achieve two aims: make our course material available to a broader audience, and begin to fill the gap of introductory materials on global health. An exhaustive treatment of global health would be impossible in a single volume; our goal here is thus to introduce some of the principal challenges, accomplishments, and complexities that constitute global health. The book is divided into twelve chapters. Chapter 2 lays out a framework of social theories to support the analysis of important questions in global health. We have found these theories a helpful toolkit for understanding both the material covered in this volume and our own varied practices within the field of global health. Though we assume no background knowledge in social theory, we draw on work by some of the great theorists of the past century, such as Max Weber and Michel Foucault, as well as more recent health-focused work, such as the notion of social suffering offered by Arthur Kleinman, Veena Das, and Margaret Lock. For readers with some background in social theory, we hope that our focus on health will elicit new insights from this material and spur consideration of the relevance of other theoretical frameworks. Chapters 3, 4, and 5 continue to build our analytic framework by examining three key historical periods critical to an understanding of global health today. Chapter 3 offers an account of colonial medicine and its legacies. One particular focus is the development of major global health institutions, including the World Health Organization, and the patterns of priority-setting for health interventions in the developing world. We trace the ways in which the economic and political priorities of wealthy nations informed assumptions about local populations and corresponding modalities of intervention. These trends have often continued to structure academic inquiry and the design of health interventions well beyond the colonial era. We also study global fascination with the power of biomedical intervention, such as the development of the first antibiotics and the pesticide DDT, in the context of two of the most important global health campaigns of the Cold War era: the smallpox and malaria eradication campaigns, which achieved markedly different results. Chapter 4 analyzes two pivotal and tumultuous decades for international public health, the mid-1970s to the mid-1990s, that profoundly influenced health systems in developing countries and shaped contemporary discourse among global health policymakers. The chapter begins with the antecedents of the 1978 International Conference on Primary Health Care, where delegates from around the world adopted the goal "health for all by the year 2000." We then trace the development of neoliberalism and the shift toward a selective primary health care approach in the 1980s. The chapter details how these geopolitical shifts led to the rise of the World Bank as perhaps the most influential institution in global health during the 1990s and considers the effects of its approach on the health of the global poor. In Chapter 5, we examine one of the most astonishing events in the history of global health: the AIDS movement. Why, after decades of austerity in the face of yawning health inequities around the world, did rich countries begin to devote billions of dollars in new resources every year to global AIDS efforts? Describing the rise of the U.S. President's Emergency Plan for AIDS Relief (PEPFAR) and the Global Fund to Fight AIDS, Tuberculosis and Malaria, we suggest that a broad coalition of practitioners, patients, policymakers, advocates, and researchers helped to expand what was deemed "possible" in global health. Global policy and resource flows shifted dramatically, demonstrating the elasticity of assumptions such as "limited resources" and "appropriate technology" and underscoring the force of vibrant social movements in global health. Chapters 6, 7, and 8 build on the historical and theoretical frameworks set out in earlier chapters and confront many of the key questions in global health, beginning with those posed by Mpatso's case. Chapter 6 contextualizes these historical trends at the point of care by exploring the resuscitation of public-sector health systems in Haiti and Rwanda, focusing on the experiences of Partners In Health. It offers a chance to see the biosocial approach in practice, in the principles behind the organization's strategy and in the delivery of context-specific health interventions. Chapter 7 outlines a generalizable framework for effective global health delivery. We begin by defining several principles of global health delivery and then analyze contemporary efforts to strengthen health systems in resource-poor settings. The chapter calls for a true "science of global health delivery" capable of improving health system performance around the globe-in areas poor and rich. Chapter 8 investigates the social construction of disease categories and health metrics in the context of mental illness and multidrug-resistant tuberculosis-two pathologies that pose unique challenges to global health practitioners. The history and political economy of these illnesses illustrate many of the themes treated in this text and highlight the role of biosocial analysis in unpacking some of the complexities of global health. We hope the chapter will offer lessons for other global health challenges that, unlike AIDS, rarely see media attention and are widely misunderstood-often at the expense of those who encounter them as illness experience. Chapter 9 examines moral aspects of global health work, including the human rights tradition. It traces the genealogy of several ethical frameworks invoked by practitioners, examining their core premises and also the practical implications of their application in global health. Many people are led to global health work by an intuitive sense that it is the right thing to do; we believe that a critical investigation of several moral frameworks can both facilitate productive introspection and expand the sphere of discourse for public engagement in global health. The last three chapters, 10, 11, and 12, sketch the landscape of global health today. Chapter 10 critically examines the rise in foreign assistance for health and development. The chapter goes beyond the question "does foreign aid work?" to ask "how does aid work?" What lessons have been learned during the past decades that might improve the machinery of foreign aid in the decades to come? We argue for a novel way of delivering effective foreign aid, which we call the accompaniment approach. Chapter 11 outlines a number of key global health priorities for the next decade. It suggests that scaling up the model of health care delivery and health system strengthening introduced in chapter 7 offers great promise in addressing these priorities. Such an effort offers a platform to reduce the burden of disease, address social determinants of health, and build long-term care delivery capacity that will allow us to adapt to new demands as they arise. But such scale-up and the ability to advance global health equity will not be possible without broad-based social change-which is the subject of Chapter 12, the concluding chapter of this book. 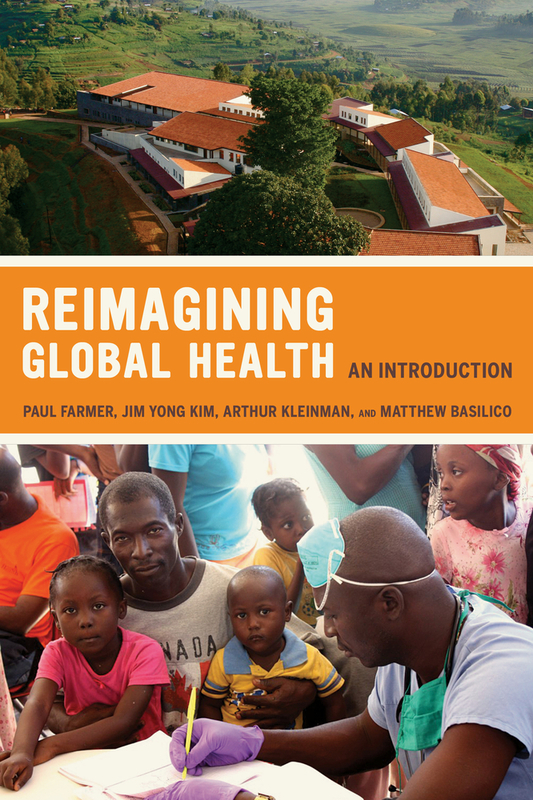 Bringing together the experience, perspective and expertise of Paul Farmer, Jim Yong Kim, and Arthur Kleinman, Reimagining Global Health provides an original, compelling introduction to the field of global health. Drawn from a Harvard course developed by their student Matthew Basilico, this work provides an accessible and engaging framework for the study of global health. Insisting on an approach that is historically deep and geographically broad, the authors underline the importance of a transdisciplinary approach, and offer a highly readable distillation of several historical and ethnographic perspectives of contemporary global health problems. The case studies presented throughout Reimagining Global Health bring together ethnographic, theoretical, and historical perspectives into a wholly new and exciting investigation of global health. The interdisciplinary approach outlined in this text should prove useful not only in schools of public health, nursing, and medicine, but also in undergraduate and graduate classes in anthropology, sociology, political economy, and history, among others. Paul Farmer is co-founder of Partners In Health and Chair of the Department of Global Health and Social Medicine at Harvard Medical School. He has authored numerous books, including Pathologies of Power: Health, Human Rights, and The New War on the Poor. Jim Yong Kim is co-founder of Partners In Health and the current President of the World Bank Group. Arthur Kleinman is Professor of Anthropology at Harvard University and Professor of Social Medicine at Harvard Medical School. He is the author of numerous influential works including The Illness Narratives: Suffering, Healing, And The Human Condition. Matthew Basilico is a medical student at Harvard Medical School and a PhD candidate in economics at Harvard University. He was a Fulbright Scholar in Malawi, where he has lived and worked with his wife Marguerite. "This inspiring book transforms the field of global health into a revolutionary global movement for human rights to combat the useless suffering imposed by North/South social inequality. The authors' historical, practice-based and theoretical arguments wrench the field out of its colonial-missionary roots and attack the contemporary greedy behemoths of Bio-Tech, Big Pharma, for-profit healthcare, and cost-benefit neoliberal triage logics to make "Health for All" a real possibility--as well as a universal human right to be enforced by political will, funding and democratic access to technology. "—Philippe Bourgois author of Righteous Dopefiend and of In Search of Respect: Selling Crack in El Barrio. 12. A Movement for Global Health Equity?